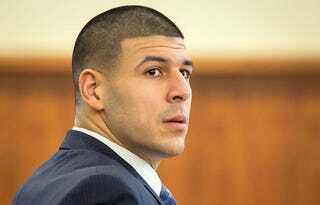 Earlier today, Diana published a thoughtful look at how Aaron Hernandez's well documented recklessness and stupidity likely will not stop him from getting away with murder. The seed of that post was an internal debate among Deadspin staff about whether Aaron Hernandez is good or bad at murder, and what it means to be "good" or "bad" at murder. In the interest of journalism ethics and transparency, as well as a need to justify the time we spent bickering about this, that discussion is presented below. It has been edited for clarity, meaning I removed the bits where people butted in to talk about actual work.